Sunday afternoon was a pleasant escape from cleaning up after six inches of rain with the high water that followed. 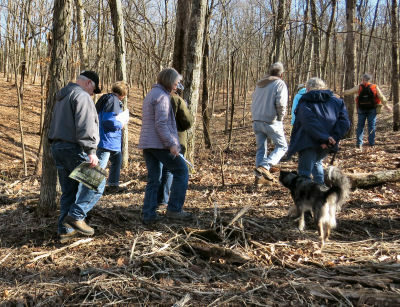 Paradoxa, the Rolla chapter of the Missouri Native Plant Society, held a winter tree identification walk. Finding trees is easy in the Ozarks. They tend to be big and hard to miss. Over the winter most trees are bare trunks and branches. For someone like me who depends on leaves and flowers to identify a plant, bare trunks and branches are daunting. Where do you start? Bark helps identify a tree in winter. The Osage orange bark (left) is yellow with long ribbons intertwined. 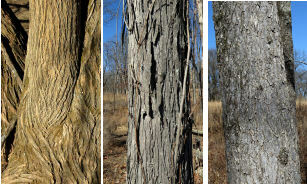 Shagbark hickory (center) has long, thin plates of grey bark. American elm (right) looks like well worn gray pavement. As the Paradoxa group wandered around looking at the different trees, several important things to look for became obvious. First was bark. All trees have bark. Take a closer look at the bark. Bark is not usually smooth and featureless. Bark has color, texture and furrow patterns. The combinations help identify the tree. Terminal buds are another help in identifying a tree in winter. Osage orange (left) has small buds on a big bulge. 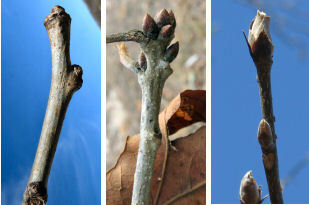 Post oak buds (center) have shingled scales and a gang of buds. Shagbark hickory (right) has a single large bud with two scales, one on each side. This bud is starting to open. A second characteristic is the terminal buds. When a tree goes dormant in the fall, it makes leaf buds covered by scales on its branches. The one on the tip of a branch or twig is the terminal bud. Some buds have many small scales giving the bud a shingled look. Others have two scales, one on each side. Some trees have a single terminal bud. Other trees like to have groups of buds. 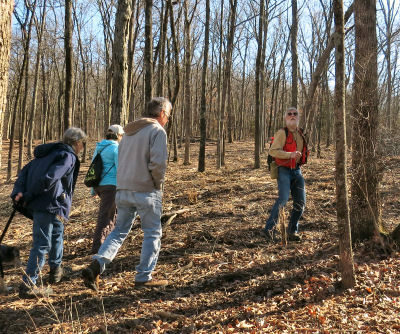 Two retired forest service men led the Paradoxa group on their winter tree identification walk. 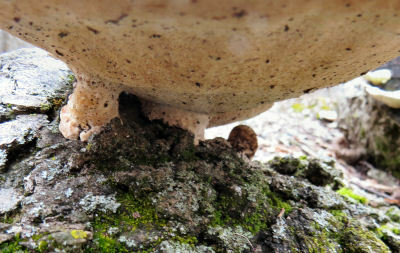 The Paradoxa group looked at the bark and buds. Some were easy like the black walnut. Others were hard. Where do you go for the hard ones? One place is the winter tree guide published by the Missouri Department of Conservation. The Missouri Trees guide has the bark and buds in it. The Paradoxa group includes people of all ages. Many are Master gardeners or naturalists. All are interested in Missouri native plants. The more interesting place to go is on a guided walk like the one Paradoxa held on Sunday. Everyone on the walk is interested in Missouri plants. Each person knows a different set of plants. As we walked along, we made comments about the different trees. Those who recognized the tree helped those who didn’t spot the best ways to identify it in the future. The Missouri Native Plant Society has chapters like Paradoxa in many parts of Missouri. 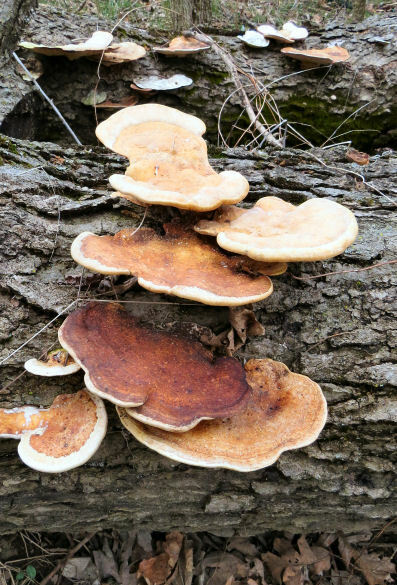 Anyone interested in Missouri plants will find joining the groups helpful and fun. 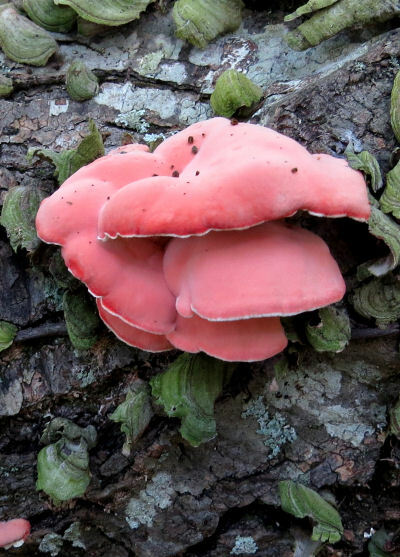 This entry was posted in Ozark Hills, Uncategorized and tagged identifying trees. tree bark, Missouri Native Plant Society, Paradoxa Plant Society, tree terminal buds on February 28, 2018 by [email protected]. Yellow is the color of late summer in the Ozarks. Yellow Ironweed is one of the many yellow wildflowers blooming along the roads and in the pastures from august to killing frost. Flower: A profusion of yellow flowers top short stems forming a loose head at the top of the plant. Not all of the flowers bloom at the same time. Each flower head has up to 10 bright orange yellow ray flowers sweeping down from the globular mass of yellow tube flowers. These are up to half an inch long and stick out individually. Leaf: The leaves are usually alternate but may be opposite in part or all of the plant. The lower leaves may have a short, winged petiole but upper leaves are sessile. each leaf has a slow taper to the center and a slow taper to a sharp point. The leaf top is darker green than the bottom and begin to take on a yellow tinge as the leaf ages. Both sides have a sandpaper texture. Stem: A single stem grows up to 8 feet tall. The only branches are at the top leading to flowers. The green, ridged stem is winged with white hairs between the ridges and wings. Root: The perennial roots are fibrous and have stout rhizomes so the plant forms colonies. 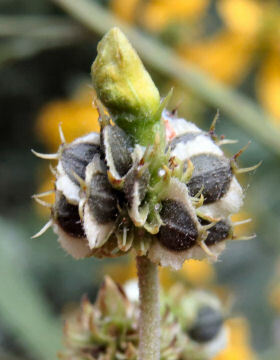 Fruit: The seeds develop inside a cage formed by the remains of the tube flowers. 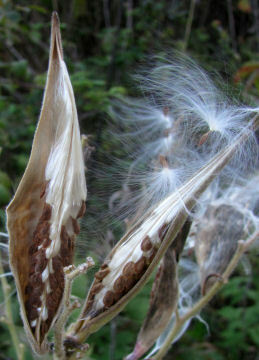 This opens to release the flat, brown seeds with small wings along their sides. Habitat: This plant prefers sunny places but will grow in light shade. It likes good soil with moisture as in lower pastures, along roadside ditches, along streams and bases of bluffs. 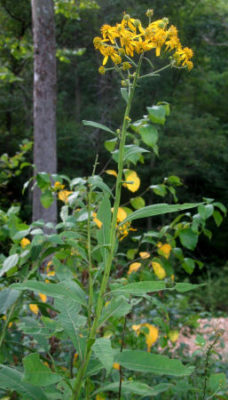 Yellow Ironweed has thick, stiff stems letting it tower over most other plants growing nearby. The stems are tough enough to withstand wind and remain upright. This lets it grow wherever it finds the right soil and moisture level. The tall stems are popular with various vines. False buckwheat, partridge pea, hog peanut, woodbine, morning glories and more twine themselves around the stems and bind several plants together. Recognizing this plant is fairly easy not only because of its size but by its flowers. The color is vibrant yellow. The back swept rays are irregular in number and arrangement. The globular crown of long, yellow disk flowers sticking out is totally different from the other aster family members. In those the disk or tube flowers are packed close together. 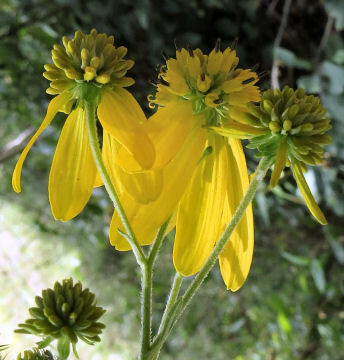 Yellow Ironweed tube flowers are separate individuals. This plant is determined to bloom and produce seeds. Even when the top is eaten off, the lower leaves send out new flower stalks. These will bloom on plants now only two feet tall. The leaves and stem tips do seem popular with deer. The leaves are large and feel rough. As the plant blooms into the fall, the leaves take on a yellowish green color. The lowest ones turn yellow and drop off. Yellow Ironweed forms colonies and seeds itself prolifically. These form yellow clouds of flowers along the roads and in the pastures from late summer into fall until frost kills the plants. This entry was posted in Uncategorized on September 6, 2017 by [email protected]. In May single, thick, square stems appear pushing their way through the dense crowd of plants. In June conical spires of flowers top the stems and the first ring of pale lavender, almost pinkish, flowers open. The Wood Sage is in bloom. Flower: A flower spike surrounds the top of the stem in whorls of two to six flowers. Green calyxes surround the bases of the flowers. Each flower has a large, white to pale lavender lower lip with dark purple mottling near the throat of the flower. 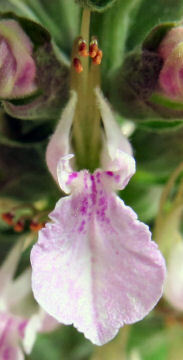 Two short upright petals flank the lower lip like ears. The four stamens and pistil arch up over the lower lip. The edges and undersides of the petals are covered with short hairs. Leaf: Opposite leaves have short or no petioles. Two leaf lie bracts spread out at the base of each leaf. The leaf is long and widest toward the middle and tapers to a point. The edges are toothed. Short hairs cover the top and bottom surfaces of the leaves. 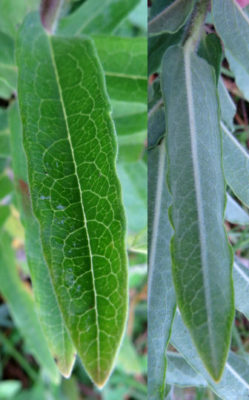 The mid and side veins form strong cords on the underside of the leaf. Stem: Stiff square stems grow three to four feet tall. Fine short hairs cover the stems. Rarely the stem branches in the upper half. Root: The roots are fibrous and perennial. There are rhizomes so the plant forms colonies. Habitat: This plant prefers open, sunny areas with moist soils such as along creeks, roadside ditches and prairies. Wood Sage can be considered a weed. A single stalk appears one year. The next year the one stalk has become a small colony. Other single stalks appear nearby. In a few years Wood Sage covers the area. Various smaller native bees don’t mind this abundance of food. They zero in on the purple splotches on the lower lip of the flowers and land to feed. For people, the flowers have no scent. The flower spikes can be eight inches long. The tall stems bring the flowers up to where they are easily noticed. The flowers are small at three quarters of an inch long but are interesting to look at with their little ears. Wood Sage is occasionally planted in native gardens. As with other mints, this one must be confined or it will take over the garden. It is a hardy plant tolerating some drought and crowding by other plants. 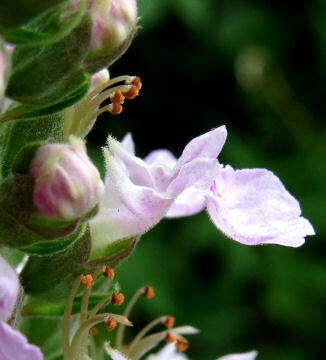 I find Wood Sage along the roads where it thrives even when surrounded by giant ragweed, blackberries and poison ivy. It does like lots of sun and withstands hot temperatures. The flower spikes make it an easy plant to identify. Enjoy more nature essays about the plants, animals and events of an Ozark year in Exploring the Ozark Hills. This entry was posted in Ozark Hills, Uncategorized and tagged American germander, mint, Ozarks, Teucrium canadense, wildflowers, wood sage on July 5, 2017 by [email protected]. Butterfly weed, Asclepias tuberosa, is fast becoming a popular garden flower. 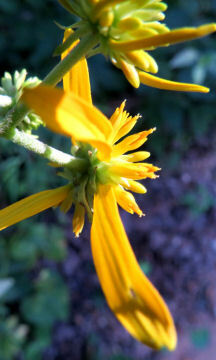 It is one of the most easily seen and recognized of Ozark wildflowers. My goal with these plant pages is to present information on a plant plainly. 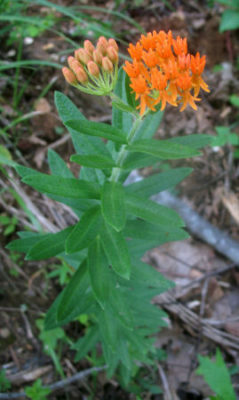 This post is set up for easy viewing online but includes the information and pictures used on the actual pages about butterfly weed. I would appreciate any feedback you may have on this information either through the comments section or the Contact Page [this may be more reliable]. 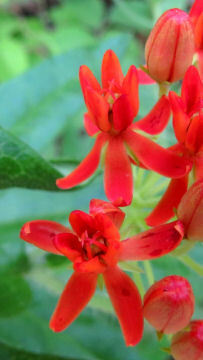 Flower: Flowers range from lemon yellow through most commonly orange to red. The corolla is backswept. The five wells have the outer wall elongated and standing upright. The five horns arch over to the central disk. The flowers are in flat topped umbels from the tips of branches and nearby leaf nodes. Leaf: The leaves are alternate and sessile. The top surface is dark green. 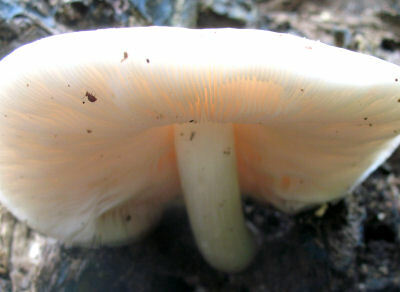 The under surface is light green with a prominent midvein. The other veins are in a network. 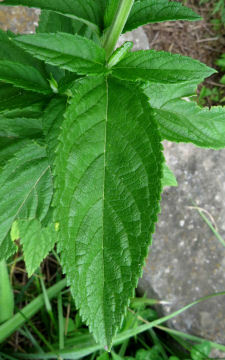 Short hairs cover the leaves especially the edges and veins. Stem: The stem is hairy and ranges from green to purple. It goes up then bends over often with a branch or two. Root: This plant has a rhizome. Fruit: Each umbel can produce several long seed pods. They tend to stay slender with a groove down one side. They are covered with short hairs and ripen to a purplish brown. The groove splits releasing the tufted seeds into the wind. Habitat: Butterfly Weed loves the sun. It grows along roadsides, in pastures, glades, open ground. 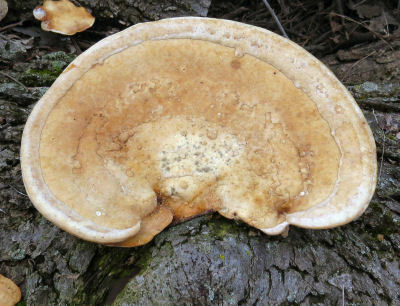 It is often in drier areas. Asclepias tuberosa is a perennial so the plants show up in much the same places every year. Their flower color is so distinctive I watch for it trying to spot the first one to bloom. Most butterfly weed around here is vivid orange. Some are paler, more yellow or even true lemon yellow. Some are deep red. Some special flowers are two toned. They open as yellow. The backswept corolla remains so but the wells darken to red. These flowers are quite striking. The greatest enemy of these plants is the roadside brush cutter. Unlike other milkweeds, butterfly weed will try to grow new stems and bloom again. 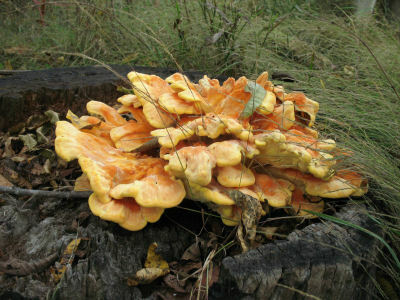 It takes its toll on the plants and these may disappear after a few years. Some of the older people in the area have successfully transplanted a special plant to their home. The fleshy fragile rhizome makes this very difficult. Failures are more common than successes but not mentioned. The easiest way to have these plants in the home garden is to start them from seed or purchase nursery plants. I was told the plant can be propagated by layering as well. The low growth habit, prolific blooming, vivid colors and attraction of butterflies have made this a popular garden plant. Although larger butterflies will stop by, I’ve seen pipevine and tiger swallowtails, most of the butterflies are smaller. Pearl crescent, little sulfurs, various skippers and gray hairstreaks hang around them creating a multicolored cloud. The usual wasps and bumblebees tromp around pollinating the flowers. This milkweed is unusual in two ways. It has alternate leaves. It has clear instead of milky sap. Monarchs do lay eggs on it. Their caterpillars do seem to mature on the plants. 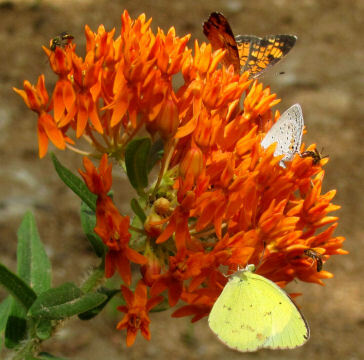 Whether growing wild or in a garden, butterfly weed is worth stopping and admiring. This entry was posted in Uncategorized on December 21, 2016 by [email protected].